With the New Introductory set Stike On Kar’A Nine now available for Pre-Order the question arises… which set do I need to get? Warlord Games have very kindly provided the gamer with a choice of starter sets for Gates of Antares now, so while I am hoping that one off the new Strike On Kar’A Nine turns up any day now gift wrapped and delivered by a man in red lets have a look at both sets. STRIKE ON KAR’A NINE INTRODUCTORY SET – NEW FOR 2017! Strike on Kar’A Nine is the introductory set for Beyond the Gates of Antares for anyone who’s never played a wargame, or for those who play other games such as Warhammer 40,000 who may be intrigued by an alternative system by the original designer, of said game, Mr Rick Priestley. The full colour Start Here book is designed to coach you through, making your first steps as exciting and as simple as possible. The full rules are explained with a series of scenarios that gradually introduce the mechanics of the game. Each scenario introduces you to further rules, allowing you to absorb the basics, culminating in a final battle using everything in the box where you will be able to use all you have learnt. 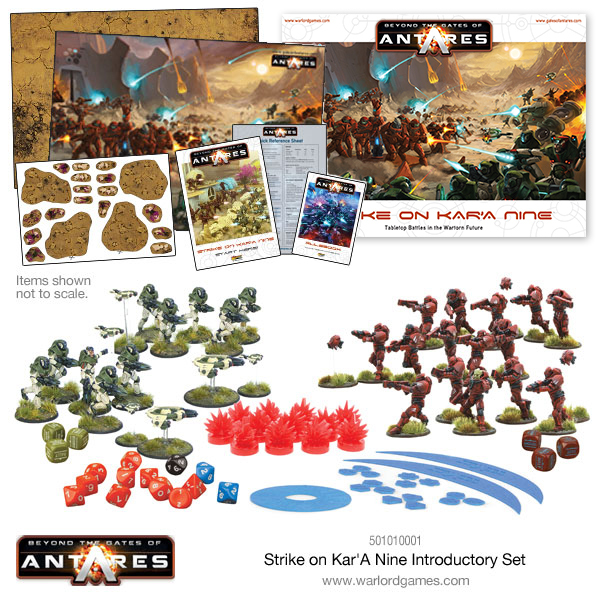 Strike on Kar’A Nine also contains forces for both the Algoryn and the Concord, with dice, rules and templates plus a fold-out battle mat and cut-out terrain – everything you need to get started with the game wrapped up in a tempting £35 box set. Now this is a departure from the norm ‘most’ games don’t come with much in the way of scenery or mats, bearing in mind that it is early at the time of writing this but the original Bolt Action, Infinity, Suicide Squad, Hawks, Deadzone and most space miniature games are the only thing I can think that come with terrain (cardboard or otherwise in a starter set) so you can after glueing your fingers together just fet straight in and play a game. 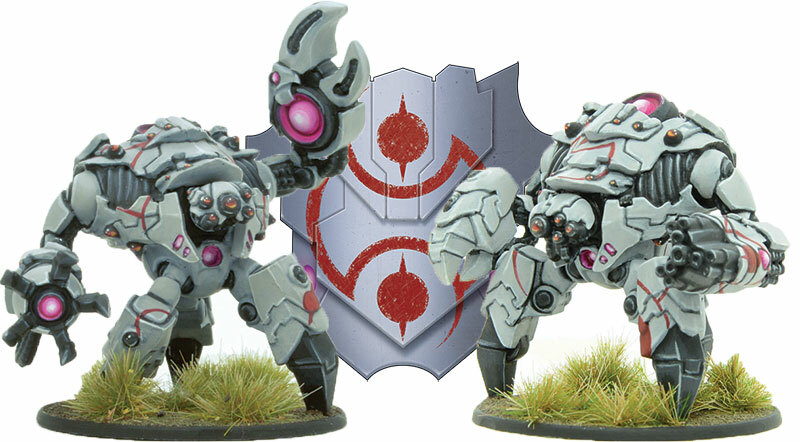 Where the new introductory Stike On Kar’A Nine set is about helping those new to the hobby or curious about the world (and fascinating rules) of Antares dip their toe in for a look, its larger brother – Beyond the Gates of Antares: The Xilos Horizon! – is a full starter set that allows gamers to fully immerse themselves within the complete background of Antares. From the mind of industry legend Rick Priestley (the creator of Warhammer 40,000) Beyond the Gates of Antares is the science-fiction skirmish wargame that pitches technologically advanced human civilizations into a conflict that no one can afford to lose. Thanks to the order dice draw system, every battle is a tense affair with both players constantly being involved in the action. The game is rich in detail and extremely ambitious in scope. The full size full colour rulebook is extensive in it’s depth of detail and the plastic miniatures offer something wholy new for Sci Fi gaming. Inside you’ll find far more than in the introductory set. Packed with army lists that describe six different Antarean factions: the PanHuman Concord, the Ghar Empire, the Isorian Senatex, the Algoryn Prosperate, the Freeborn Vardos, and the Boromite Guilds. Beyond the Gates of Antares game play utilises the successful and exciting dice activation system first pioneered in Warlord’s popular and award-winning Bolt Action WW2 wargame – ensuring that both sides remain active and engaged throughout every game. There is no down-time – action is fierce, fast, constant, and unforgiving. Resolution is by ten-sided dice offering considerable expansion and great range of detail compared to traditional six-sided dice. The rest of the starter set contents allow 2 players to get to grips with the Pan Human Concord or the Ghar Empire, with a very iconic and new Sci-Fi look that’ll capture your mates attention when they roll onto a battlefield. 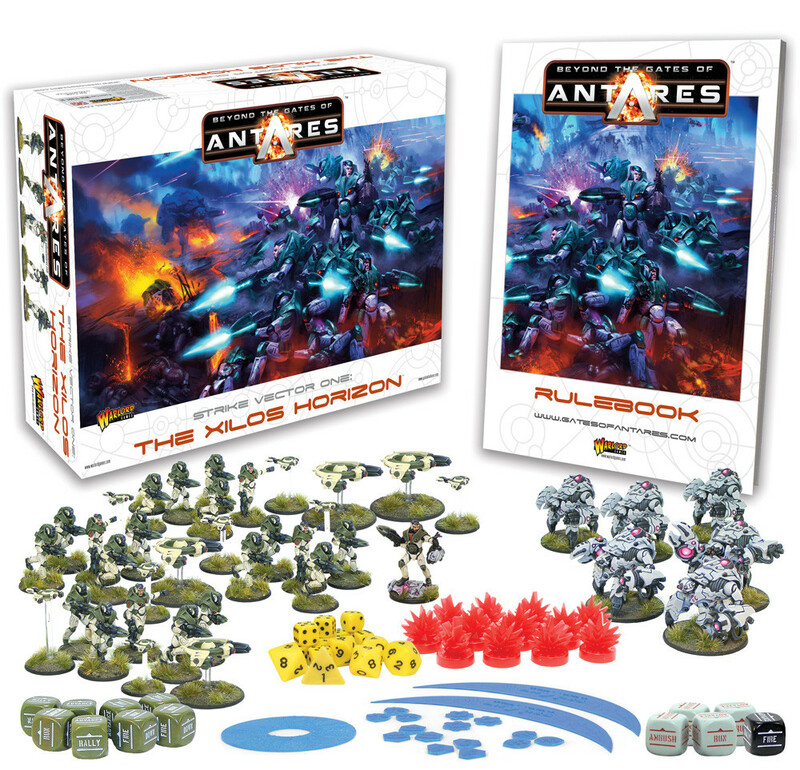 Thats everything 2 players would need to start their factions in Antares for just £70! The Ghar provided in the Battle for Xilos set is a nice start for any Ghar commander but will need some work and expansion to be a large battle force, the Concord have however enough kit to get to and possibly beyond the 1000 point mark so you truely do have an army in the box ready to build and deploy! We think you’ll be wanting both! But if you have to make a choice, Strike On Kar’A Nine is a simple ‘start here’ set with a fantastic price to help you and/or friends get started. Whilst ‘The Xilos Horizon‘ is the gamers starter set that again offers fantastic savings for 2 people starting new armies, and provides the full hardback rules that are a must to really understand the intricacies that are there to be discovered, as well as provide you with years of exciting and challenging game play. PRE-ORDER STRIKE ON KAR’A NINE TODAY! That’s over £50 worth of plastic troops alone in this awesome value set!